Perhaps the strongest extension of transmedia storytelling for music is live events. It allows for fan interaction, engagement with the artist, physical manifestation of narrative, and community building. It can also be the most difficult extension, as it requires a commitment of time on the artist’s part, and money from them, the record label, or an outside source. This is why it is so rare to experience a live event, but when one does, it is incredibly exciting. 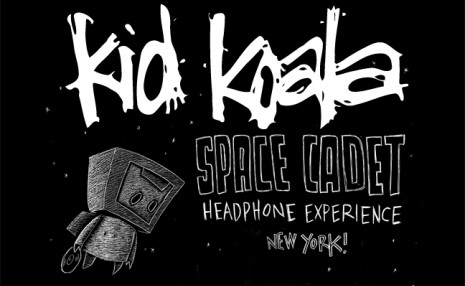 I bought a ticket to turntablist Kid Koala’s “Space Cadet Headphone Experience” the moment it was announced, as I really enjoy seeing him perform. What I soon realized was that the event was the live extension of his album-and-graphic novel Space Cadet, featuring carnival games, wireless headphones, inflatable space pod seats, in-world artifacts, and a variety hour-style performance! 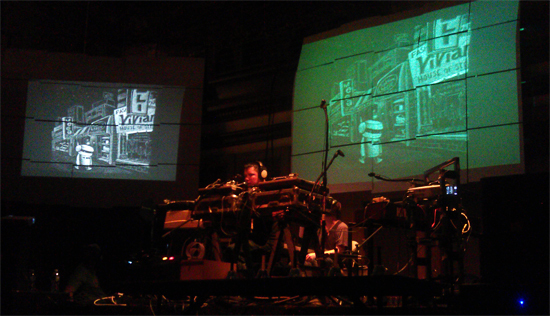 Kid Koala (real name Eric San) is no stranger to innovative production. Besides his signature turntablism with unique samples, he has collaborated with the Gorillaz, performed for kids with Yo Gabba Gabba!, illustrated a previous graphic novel Nufonia Must Fall, and curated a cabaret-style tour with other DJs called The Short Attention Span Theatre. It is these experiences that Eric drew from to produce the Space Cadet Headphone Experience. I spoke with Eric and he was kind enough to fill me in on the process. 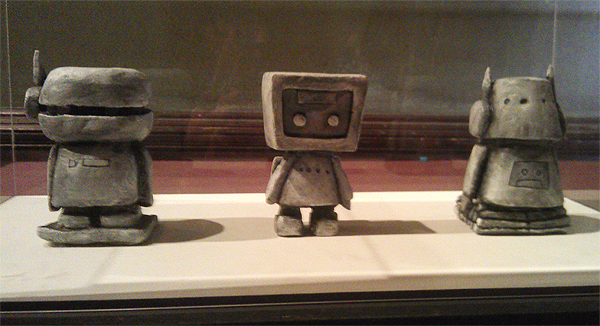 He began drawing the book Space Cadet in 2003, using a special type of etching board. The story of a robot and his space-exploring daughter has no dialogue, so Eric recorded an entirely new album for the reader to play as they sat with the book. The Headphone Experience is an elaborate set-up, so it has only been hosted in museums or performance/art spaces, usually for a few days at a time. At the Brooklyn shows, the attendees entered and explored a balcony area while waiting to head into the main space. 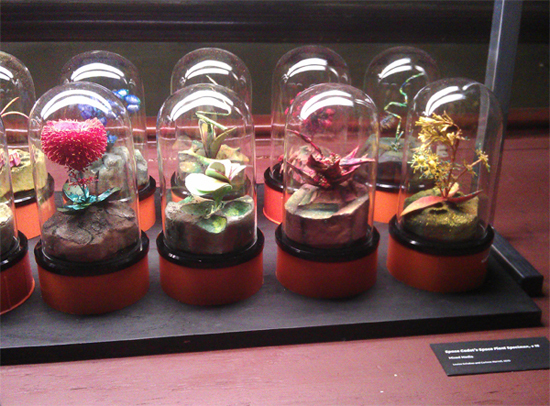 The area was filled with little exhibits of in-world material, such as extraterrestrial flowers the explorer collects, or clay carvings of the main characters. Pulp art of space exploration lined the walls, along with some of the original sketches Eric created. Further along, attendees were able to participate in carnival games, such as knocking over cans with the explorer’s space suit face on them. Participating in games earned you raffle tickets, which were used during the show to give away prizes such as books or jackets. 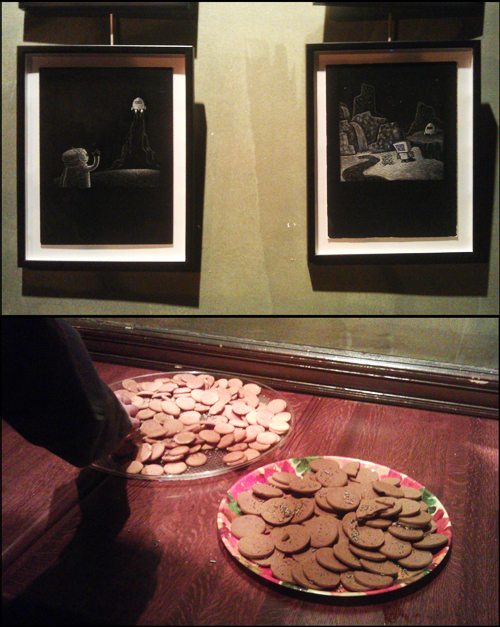 The audience even got to decorate and then eat their own cookies! All of these little details and activities involve the audience member, and make them feel lucky to have attended a unique and localized event. After a short opening act, the audience headed into the main space, which was filled with large inflatable “space pod” seating. They were handed wireless headphones which broadcasted Eric’s music directly as opposed to using speakers; only the ambient sounds of a spaceship played in the open air. The stage consisted of Eric’s instruments, gear for an additional musician, and three large screens behind them. As Eric performed, close-up video of his hands on the turntables would project. Other times, the screens showed moving images from the graphic novel. Having pulled “from musical concerts, to theater, to cinema, to visits to the science center,” it was more of a live event than a concert. Eric would play, but also talk to the audience in between songs, describing the project, what else he had been working on, or just cracking jokes. Interspersed throughout, he would call upon one or a few audience members to come up and help him play a song or a game. A man was chosen to play a video game ala Asteroids where he shot meteors that carried the pictures of other audience members’ faces. The photos were taken in a booth in the carnival section just before the show! Is this replicable by other musicians? With enough care and time, absolutely. Kid Koala is not on a major label, nor has he sold millions of albums, and yet he was able to put on these live events self-funded. One way to make this work is to pull in sponsorships or partnerships. Eric originally workshopped the show at the Museum of Contemporary Art in Massachusetts in 2009. He quickly discovered that 250 sets of plugged-in headphones made for an unpleasant experience. Thankfully, Sennheiser came on board and supplied them with all the wireless headphones they needed. “[It] has been amazing asset to us. The Sennheiser headphones sound great, they are much easier to set up, and now people won’t get tangled up in 1000’s of feet of audio cables and extensions if they need to get up and go to the bathroom.” These types of partnerships improve the quality of the art for the musician, and give the supplying company exposure to potential customers. And keeping most of the budget self-funded allows for as much creative control as possible. This event was immensely enjoyable and effective. The production and venue immersed the audience in the Space Cadet world without hitting them over the head with it. Space Cadet is ultimately a touching and sad story, and Eric was able to bring certain elements into our world while still keeping the event light-hearted with games and crowd interaction. There was a healthy balance of active and passive participation, giving the attendees agency to explore at will in the balcony, and then sit back and let Eric lead them during the performance. The event was also inclusive, with content that appealed to all ages and an earlier performance specifically for adults to bring their children to. Most importantly, it is Eric’s ability to test out and improve productions over time that musicians should be paying attention to. Transmedia storytelling is not an easy feat, certainly not for music, and it can require a level of patience to invest time and energy into developing the different parts until they work together. Eric stated, “All my shows are in a state of constant evolution. I’m always trying to find new and better ways to improve the show.” This persistence is clear in the quality of the work and a true takeaway point for any transmedia storytellers.